I am so thankful for the people that have helped us over the years with this project! There are a couple who have been here from the beginning, and others that we’ve just met. We really appreciate each one of them. A few months ago a reporter from The Oklahoman newspaper joined us and learned about our work. It was fun sharing with her and answering her questions. The article she wrote about us was published February 12th. While it is a great snapshot of our work, it’s important to know that we have lots of great volunteers that didn’t make it into the article. One of those is a lady who lives in Michigan and has sent over 800 scarves over the years. Yes, over 800! If you’re looking for a great way to encourage people going through a tough situation, we’d love to have you join us. You can visit with us at a Work Day, or work on your own and drop them off during the week. A great story about us! We’re excited to share that The Christian Chronicle published a story about us! You can check it out on their site. There’s even a video from one of our Work Days. Thank you everyone who has helped make it possible for us to continue this good work. We really appreciate you and all you’ve done! We appreciate Chellie Ison and the rest of the Christian Chronicle staff for their great work on our story. We are so proud of our 3 who finished the race on Saturday! 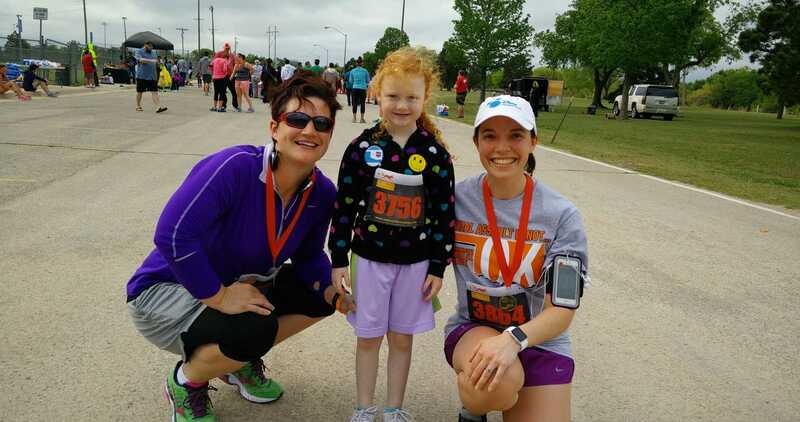 Threads of Compassion had 5 people registered this year in the YWCA’s 2 Minute 5K. Three of them ran and 2 decided to “Snooze for SAAM”. What an encouragement to have these 5 join us this year! The three in the picture made it out to the event and ran. Our youngest ran in the Kiddie K, while our 2 adults ran the 5K, finishing quite early. A short way into her race, the little one said “I’m tired of this running thing”. We hear you, kiddo! Sometimes us survivors get tired of the running thing, too. Tired of being reminded of the assault, tired of working on healing, tired of the random moments of fear that seem to pop up out of nowhere, tired of wondering if it will happen again, tired of figuring out how to regain a sense of normal after tragedy, tired of thinking about it all. Yet, at the end of the race she told us “I ran the whole way, I didn’t walk at all!” And she was proud. That pride is how we feel about survivors who keep on going. We’re proud that you face another day, that you keep on going even when you wish you could turn back time. We’re proud that you move on, deciding that evil won’t win. Through our participation in this event and through the scarves we make, we are attempting to let you know we’re proud of you and we’re standing by your side. Saturday’s event was a chance to join together to support survivors. It’s also a chance to remind our community that we can make a difference. Not only can we stand with survivors, but we can work on teaching each other that kindness is valuable, that assault isn’t ok. Five of us have new t-shirts to wear. They’re grey with orange text that says “sexual assault isn’t OK”. We’ll wear them proudly this year as a reminder of a successful race, and as a reminder that we can all work together to support survivors and stop this violence. To the five who participated this year (and those that joined their fundraising efforts): Thank you! We’re already looking forward to next year and hope you can join us! We have a sweet volunteer that I’d like to share a bit about. She began working with us in January of 2011. Though she lives in another state she has faithfully made scarves with us for 5 years. She heard about Threads of Compassion OKC from her daughter here in Edmond and was happy to join in. This photo includes some of her beautiful work, with her most recent donation she passed the 600 mark. Yes, 600 scarves donated by one volunteer! Amazing, huh? What’s even more amazing is that she had a stroke a year and a half ago. Her right side was affected and she was initially unable to crochet. The use of her fingers and hand were the last things to come back. After a lot of therapy and hard work she says that she is so grateful to God that she can still crochet and quilt like she used to. Crocheting was great therapy for her and she just loves making scarves for the group. Thank you sweet lady from another state! We appreciate you and look forward to many more years of working together. You have been a blessing to this project. A picture is worth a thousand words, right? Well I’d like to share some words about this picture. Getting the word out about Threads happens in a variety of ways. One of those has been through NextDoor. It’s a private social media network for neighborhoods. My neighborhood participates in it. So one month we shared our work day as an event within the app since we meet in the neighborhood. A neighbor saw the event and stopped by the work day. We enjoyed meeting each other and she planned to join us again. But, we had some bad weather and several months passed before she was able to come back. 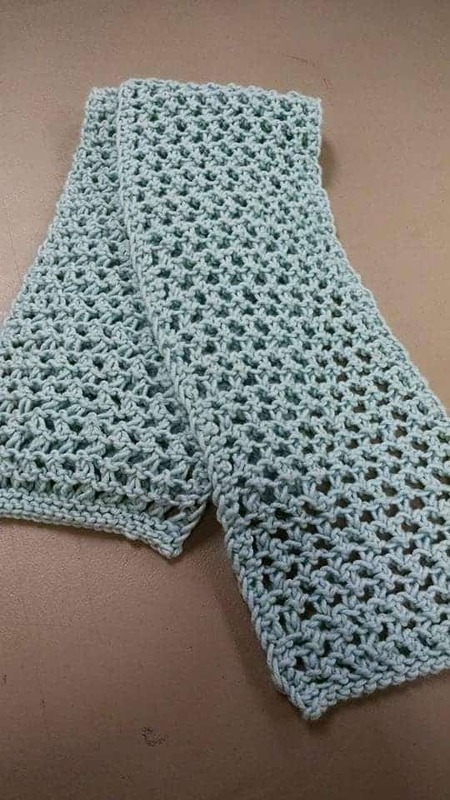 In July she stopped by to drop off the pictured scarf and share an experience that motivated her to keep working with us. She gave me permission to share that experience. Working on a scarf one day someone saw her and asked what she was making (that happens pretty often if you’re crocheting or knitting out in public – it seems to be a great conversation starter). After discovering that she was making a scarf for Threads of Compassion the person who initiated the conversation visited with her a bit and then came back with a scarf in her hand. It was a scarf she had received from Threads of Compassion. Yep, you read that right…while working on a scarf for Threads she encountered someone who shared with her the scarf they had received! What a small world we live in. 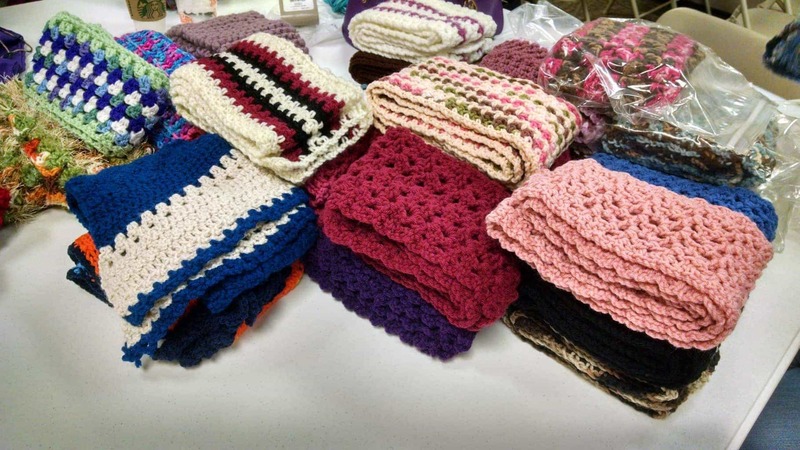 So, those times that I wonder if we should keep creating scarves and keep meeting, I can look at the picture of that scarf and remember that real lives are being impacted by the work we are doing. One of the best things about Threads of Compassion is the encouragement that comes from working together. The reminder that survivors aren’t alone is a real benefit of the project. If you’d like to join us, please check out our events page and stop by sometime. We’d love to meet you!